IR Blaster. IR Emitter. IR Cable. They all refer to the same thing, the cable you see above. The whole point of an IR Blaster is to give you control over something you can’t see. An IR Blaster cable works the same way a remote control does. In fact, the “bulb” end of an IR Blaster has the same sort of infrared LED that a remote does. Just place it in front of the thing you’re trying to control and it sends the same signal that your remote does. Where it gets those signal depends on your setup. Most commonly, it’s from some sort of remote extender like the NextGen Remote Extender. Typically, you’ll hide a component (like a TV or streaming box) in a cabinet, put an RF receiver in that cabinet, and run an IR blaster cable to the device you want to control. IR blasters are also used in RVs sometimes to let you control equipment in the back, but it’s really the same scenario — you’re trying to control something without physically looking at it. 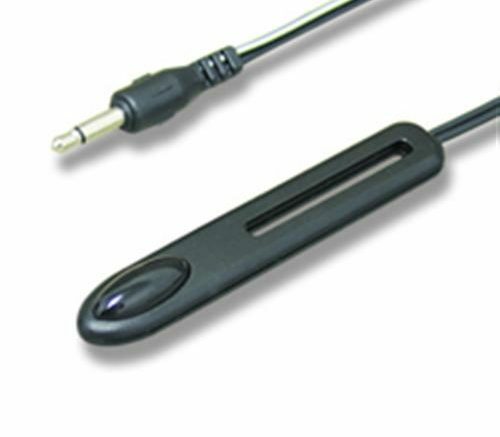 IR blaster cables come in different lengths and different designs, but most of them use the same 1/8″ TRS plug (like a headphone). The one you buy depends on the length of cable you want and the shape of the emitter, which would let you control more than one thing at a time if properly aimed.